The video portal Dailymotion added high definition video support back in February. High definition content is not for everybody especially not for those users who use a low bandwidth connection or hardware that is incapable of handling the load caused by the contents. That seems to have been a major concern for the developers over at Dailymotion because they decided to develop and release a high quality option for users of their video portal. High quality videos look better than the default low definition videos but require less bandwidth and computing power than high definition videos. A compromise between quality and technical requirements so to speak. 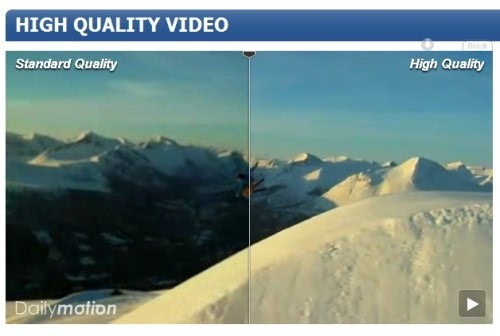 The high quality option displays videos encoded with the H.264 codec which according to Dailymotion does not require additional bandwidth compared to the SD version of a video. It furthermore uses AAC 96 kbps audio encoding and a resolution of 512:384 and 30 frames per seconds. Dailymotion created a website detailing the advantages of the high quality codec by displaying an standard definiton version next to the high quality version which gives a good impression of the quality differences. The high quality version has to be enabled once by clicking on the Dailymotion Menu button and selecting the High Quality option. The setting will be stored and the option will be enabled for all videos from then on. 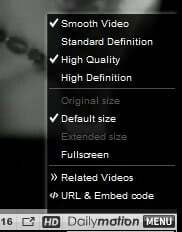 This is also the menu to change to other quality settings like high definition or back to the standard definition videos. Yeah, Dailymotion is one of the best video portals out there what quality concerns. I wonder if there is a setting to force HQ playback on dailymotion (embeds)?